It's time for the humans. Collections of pigs, rats, sea creatures, and other trade characters have been featured on Korea & Animation. Now, it's the humans' turn. Specifically, realistic human characters. 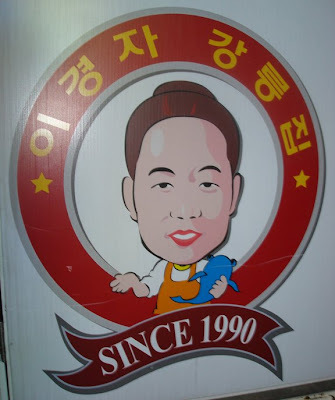 There's an aesthetic in Korean advertising and trade character design that calls for realistic looking human characters. This "realistic human look" features humans who aren't very cartoon-like, but aren't completely photo realistic either. 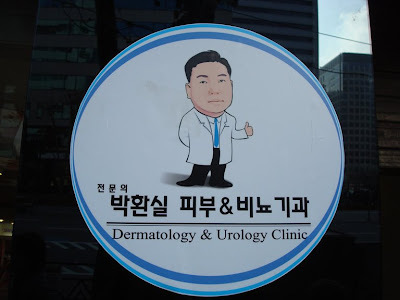 That dermatologist/urologist above must be based on a real doctor, right? He seems too imperfect to be fabricated. 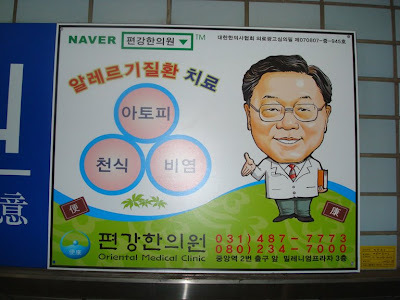 Here's another doctor. 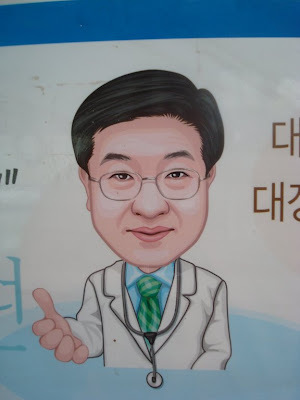 The realistic human look is employed often with doctors. Maybe because it's important to display authority. Authority would be lost if the character design was goofy looking or overly cute. Using these characters presents a friendly face and the realistic human look establishes that this face belongs to a real person. Of course, that real person has blemishes and imperfections that are glossed over by this aesthetic. 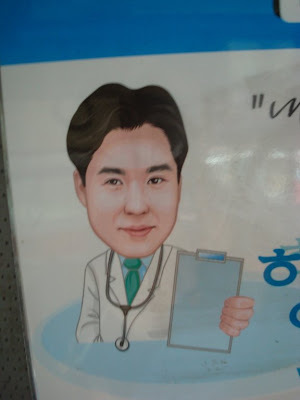 The face of a real doctor on an advertisement could be a little jarring and make the message less appealing. 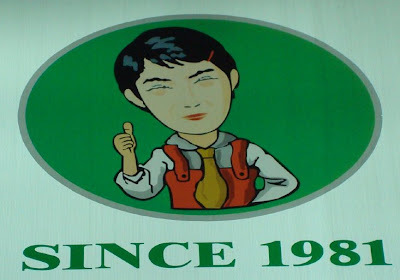 This pizza place trade character is more realistic than the doctors. Maybe too realistic. 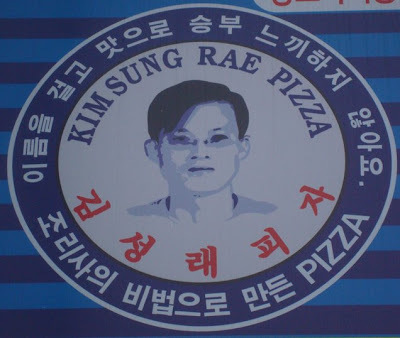 Kim Sung Rae must be a real person who this pizza place is named after. 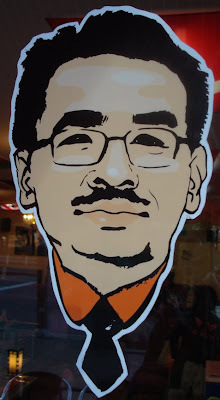 Here's a trade character featured at a popular kimbab restaurant. She seems friendly and familiar, like the kind of woman you'd meet working at any given kimbab place. Here's another restaurant's realistic trade character. Of course, he's giving the thumbs up, which is a ubiquitous gesture for trade characters regardless of species. Don't you feel like you know this guy? He seems awfully familiar. A little like your wild co-worker isn't he? Since he's the trade character for a chicken and hof place, his face needs to communicate the fun you'll have after a long week at work. A fun part of the realistic human look is that the body doesn't need to follow the rules of the head. Whereas the head is mostly realistic, the body can be unrealistically scrunched up so that it fits into the overall design. Here's where this aesthetic gets really fun. Realistic humans can be paired up with unrealistic animals. Even if a little strange, that's really squeezing the best out of all aspects of character design. Imagine how more strange it would be if that octopus was designed to look realistic! 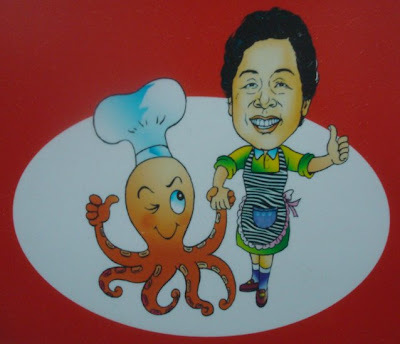 Hey Midodok, you left out the best one of all- the guy lovingly hugging his giant raddish. It's both a real photo and a cartoon and the real pic is often blown up to sit on his stores. Ha ha, it looks like unnatural love! 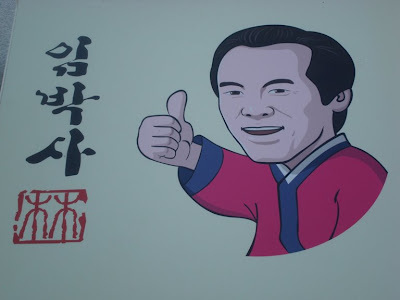 You know, Kangnam is ridiculously overpriced- have you thought about moving to the North side? I lived there for 6 years and it was cool. I think there's more cool cartoon stuff on the North of the Han whereas the South is all about who you know/who you've got connections to/look at my new car. Is the studio you're at in Kangnam? Alex: I have not seen that radish, but I sure hope to! The studio I'm at now is in the northern part of Seoul. In fact, there is a wealth of cartoon characters there that I haven't had a chance to capture quite yet. Ween: I think the thumbs up is a way to have the character doing something. 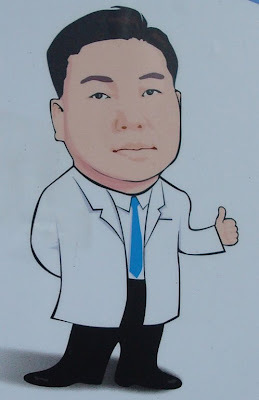 Somebody who really wants to attract attention should have a character doing a thumbs down. Cute, cute, cute blog!! I was searching on Pororo for my toddler and found my way here. I love it. Your captions are hilarious. I love how even the graffiti is somehow "polite", smiley faces and all, isn't that pleasant? Hey, Bokumbop, I'm glad you enjoy it. Now, I onlh have to get around to updating it. 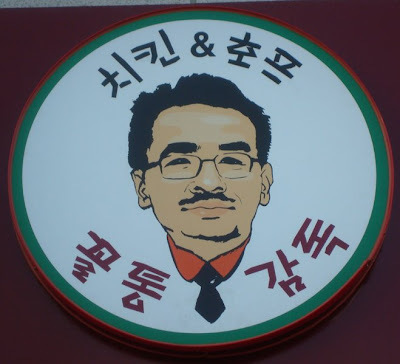 . .
Hi I just came across this weblog while i was searching eating places in korea i am heading to this week with koran americans who have never visited korea. I enjoyed your animation related blog. I will check it out in Seoul. This is very funny photo.